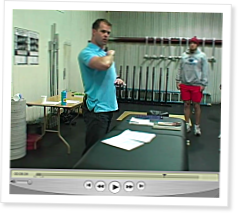 In this video Kelly shows us a checklist for seeing where your impingement is in your shoulders focusing mainly on someones posture. Man I think I'd go anywhere Kelly is speaking. Great video! Just in time video, I'm working on getting my shoulder off the dl. So Kelly why not package a DVD with all your talks! Kelly is The MAN! Another great learning session. Ditto! What a great video! Thank you! I've had the great opportunity to attend both lectures in Santa Cruz and I can't even begin to tell you how valuable they were! If anyone has the opportunity to hear Kelly give a lecture, do it! He also fixed my shoulder after one PT session. He's also one hell of a nice dude. I am not totally clear on what is meant by the "notch" in the abs in the assessment of posture - can anyone shed light on this? Other than that very helpful video - I found I am very internally rotated, especially on the non-dominant side, and suspect that may be why it gets hot after lifting overhead. I'll be working on posture big time in the next few weeks! WOW!!! I have an Acromion type 3 shoulder, am I screwed? Wow, that is seriously some of the most useful knowledge that I have ever heard on the causes and fixes for shoulder impingement. This injury is so common in the community that I work in but I have not sen anyone actually attack the root cause of impingement, poor posture. Its so simple, like eating right, that I never thought about it before but its fundamentally important to shoulder functionality that this video hit me like a slap to the forehead. Thanks Kelly, I can't wait to take your course in Seattle later this year. Nice work! I am not only impressed with the knowledge of many of the lecturers (Perfect Example Kelly) but with the ability to deliver the message! Kelly knows more about the shoulder anatomy and pathology than most non- Sports Med Physicians! I want to see the rest of the checklist! Can a lifetime of poor posture be fixed? like 30 - 40 years of poor posture? Kelly always engaging, entertaining and informative. Understand everything in the video. Question: is it bad to have the shoulders forward in the rack position for say a push press? Specifically, is this posture issue an every day, every exercise thing or is there exceptions when training specific exercises? Or is this check list a constant? Hope that makes sense... thanks so much! I second the question about rack position. Should my shoulders be back and down for the rack, or can they come forward (as I thought they should) to receive the bar? Clearly there can be many causes of impingement (primary instability for example) and the information presented here represents the 80% rule (most people 80% cases are improved with this kind of intervention). Felipe--You are not screwed, you just have to be more mindful and perfect. You have less functional tolerance to buffer bad positioning. Paul SR--The notch is just a cue to keep the rib cage tied down with the internal obliques. When the abs are set you will get the notch. Once the abs are on, you will be able to bias your ribcage into a better pressing position without loosing the effect of your scap stabilizers. JP--You can always improve, at any time, forever. RB--The shoulders absolutely have to come forward to be able to support a bar in the front rack, or any task requiring that set up (carrying and placing sandbags/rocks/etc). The keys is to have enough capacity in the shoulders to be able handle these positions. If you end up biasing your positioning with poor postural habitus, your front rack will be affected. We should try to strive to strike a balance between "best-fit" set up (biomechanical ideal) and the requirements of the task. Pressing from a rack is much easier than jerking after a brutally heavy front squat. Our shoulder don't have to have freaky perfect positioning unless you cannot tolerate any other position. Thank you, I agree. Glassman, Berg, Rip, et all are profound thinkers and communicators. I have this problem, post the rest of these videos already!! I was doing Muay Thai for 7 months and it ruined my left shoulder. I've stopped Muay Thai now for 2 months and I still have a clicking in my shoulder when I rotate it and it still heats up like soup as he describes it. I've been doing external rotations, scapular retractions, and a lot of icing and it is improving. I'm sure the next installment of these videos will be very informative. Will do sir and thanks for the advise. Perhaps some of you can help me out. Im a firefighter and active CF'r. I have little to no pain in my shoulder in the CF gym unless I irritated it prior to the WOD. Where I have been 'impinging' it (if you will) is playing basketball at work. We play some fairly serious games of ball for an hour or two in between calls. Some days its fine and I dont feel a thing and some days as soon as I go up to block my first shot a sharp pain runs through my shoulder. Its not painful unless my elbow starts to go overhead. I warm-up fairly well, really concentrating on my shoulders but it doesnt seem to help. As soon as I hurt it it hurts for a couple/few days. I will definitely work on better posture and start using ice but is there anything else you can recommend? Also, if I take my opposite arm (right) and grab my hurt one (left) and pull the injured arm over head I dont feel the pain at all! As soon as I raise the injured arm over head on its own power I feel the pinch. What you think?? Thank you for your time guys! !